How To Change A Flat Tire On A Car In 5 Minutes? Flat tires happen to all drivers eventually. If you don’t know how to change a flat tire, here are some steps to help you do so quickly. The first step is to assess the situation. When changing a flat tire, you want to make sure your car is parked far enough along the shoulder that it doesn’t pose any safety risk with other drivers. If it’s dark out, you may want to lay some safety road flares by your car, or you can put your emergency blinkers on, if your car has some. Next, you’ll want to assess your tire’s condition. 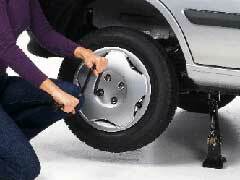 If you don’t know how to change a flat tire you might be tempted to use flat tire repair tools such as Fix-A-Flat. While this does offer a temporary fix, it’s important to know that you’ll more than likely still need to change the tire. If you decide to make the change, make sure you have the right tools. Almost all modern cars come with tire changing kits, which include a hydraulic jack, a torque wrench and a jack stand. You’ll want to get these out and set them beside the tire you are changing. To start, make sure your car is parked. Then, you’ll want to pry off the wheel cover and loosen the lugs, but don’t remove them just yet. After this you’ll want to place the jack in the proper position under your car. For this step consult your manual as each car is different. It’s important your jack is on flat solid ground as this will ensure your safety. Next, you’ll want to lift the car until your tire is one inch off the ground. The following step is removing the lugs, making sure to place them in an area where they won’t get lost. Then you remove the tire. This can be difficult to do as the tire will be heavy. You’ll want to put the new tire on and then carefully refasten the lugs. Lastly, you want to slowly lower your car back to the ground. Once the car is lowered, double check to make sure all lugs are fastened tightly. As you can see, learning how to change a flat tire isn’t a difficult process. As long as you are safe, consult your owner’s manual for jack positioning and take your time you can do this. Further, this can save you money as flat tire repair cost can be pricey. Along with learning how to change a tire, there are many products out there that can prevent this process to a point. Run flat tires are a great option as many can run on zero pressure for up to 50 miles. Still, this is only a temporary fix, therefore by learning this process you can have peace of mind in knowing what to do if the situation arises.